You will be delighted that there are numerous Delray Beach hotels that are ideal for families and all type of beach goers who are seeking comfortable as well as affordable lodging. For beach goers looking for a historic boutique property with a beach club then try the Colony Hotel and Cabana Club or romantic couples will enjoy the Crane’s Beach House Boutique Hotel and Luxury Villas. Travelers looking for an upscale environment that is trendy should stay at the Delray Sands Resort on Highland Beach or the Delray Beach Marriott as well as the Seagate Hotel and Spa boasts luxury with access to a beach and country club. Families searching for value can book at the Wright by the Sea which sports apartments with full kitchens or the Delray Breakers on the Ocean as well as the Residence Inn by Marriott have kitchens and complimentary breakfast. The Delray Beach Marriott is an upper-mid-range Delray Beach hotel that has an elegant appeal, great beach access and is nice families as well as all adventurers. Located along North Ocean Boulevard overlooking the Atlantic Ocean, the Delray Beach Marriott has quick access to the beach which is only steps away and is a mere 3-blocks to the Sandoway House Nature Center. The Delray Beach Marriott has a modern six floor architectural style with Spanish Revival accents that contains 277 rooms and suites that boast a contemporary beach decor. Standard, Deluxe and Premium rooms are 225 square feet with a choice of bedding, floor to ceiling windows and a private balcony that has views of the surrounding area, partial-ocean or ocean. One-bedroom junior suites range in size from 345 to 385 square feet with a wet bar area, a choice of bedding, separate living room and floor to ceiling windows with views of the surrounding area. Deluxe and Luxury suites are sized similar with a private balcony that has ocean views and you have access to the Concierge Lounge where you will find complimentary food and beverage service. The two-bedroom Presidential suite has 1,500 square feet with a separate living room that has a sofa sleeper, floor to ceiling windows, 2-bathrooms and a private balcony with Atlantic Ocean views. There are also a number of luxury villas that range from one to three-bedrooms with a kitchen, separate living room and private pool area. The Delray Beach Marriott is directly across the street from a nice beach area where you will find beach and watersport equipment for rent from outside vendors. The property is within a short distance to the Pineapple Grove Arts District, the Cornell Art Museum and you are less than 6-miles to the Morikami Museum and Japanese Gardens. The Marriott Delray Beach hotel has two freshwater swimming pool including an adults only pool with drink service from Cascade Poolside Grill, a fitness center and a full service spa. Dining onsite includes Seacrest Grill which serves breakfast as well as lunch and O’Grady’s Lounge serves dinner. Offsite eateries within a short walk include Deck 84 for seafood, J and J Seafood Bar and Grill as well as El Camino prepares Mexican dishes. Nightlife includes a piano bar at O’Grady’s Lounge and there is live music at Boston’s on the Beach or you can try the Blue Anchor British Pub for a cold drink. If you are interested in a laid-back Delray Beach hotel that offers all-suite units, is directly on the beach and is perfect for all types of beach goers then the Wright by the Sea is ideal. Located along South Ocean Boulevard 2.5-miles south of downtown, the Wright by the Sea has 2-acres of manicured gardens directly on a stretch of private beach and is less than 3-miles to the S.D. Spady Cultural Heritage Museum. The Wright by the Sea has a modern two story architectural design with Colonial accents that contains 29 apartment units that have a beach interior. Studios are sized at 300 square feet with an open floorplan that has a full kitchen, sleeping area and a shared balcony that has Atlantic Ocean views. One-bedroom suites are 500 square feet with a separate living room, a full kitchen and a shared balcony that offers ocean views. Larger corner one-bedroom suites have 600 square feet with a separate living room, a full kitchen and a shared balcony with ocean views. Two-bedroom apartments are 650 square feet with a separate living room, a full kitchen, 2-bathrooms and a shared balcony that has ocean views. There is also a 1,000 square feet beachfront one-bedroom suite that has a separate living room, a full kitchen, oversized windows and a private patio that boasts Atlantic Ocean views. The Wright by the Sea is directly on a nice private beach area where you will find complimentary cabanas and there are watersport equipment rentals from local vendors. The property is nearby to several attractions such as the Atlantic Dunes Park, the Gumbo Limbo Nature Center as well as the Morikami Museum and Japanese Gardens are within 6-miles. The Wright by the Sea Delray Beach hotel has a freshwater swimming pool with a tiki bar, picnic area that has barbeque grills, shuffleboard and croquet. There is not a restaurant onsite but you can enjoy a leisurely home cooked meal in your suite. Offsite dining options require a short drive to Cabana El Rey for Mexican specialties, City Oyster prepares seafood and Scuola Vecchia Pizza E Vino serves Italian cuisine. Nightlife is quiet with a sunset walk on the beach or you can drive to Honey for dancing and there is live music at Johnny Brown’s. When you are seeking a trendy atmosphere in a Delray Beach hotel that also boasts direct beach access, an easy drive to several attractions and is good for all types of travelers including families then the Delray Sands Resort on Highland Beach is superb. Located 3-miles south of downtown along South Ocean Boulevard, the Delray Sands Resort on Highland Beach is situated directly on the beachfront of Highland Beach and is 4-miles away from the Gumbo Limbo Nature Center. 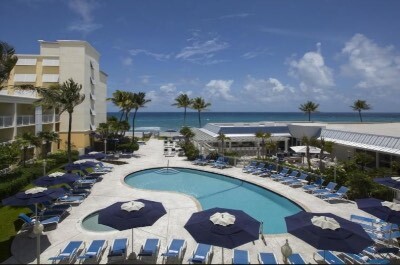 The Delray Sands Resort on Highland Beach has a modern six floor architectural style with 115 rooms and suites that boast an upscale contemporary decor. Rooms have a choice of bedding with king size bed rooms including a sofa sleeper and there is a private balcony that has views of the surrounding area, gardens, pool area, partial-ocean or beachfront. Pool view suites have a small kitchenette (microwave and refrigerator), a separate living room that has a sofa sleeper, a wet bar area and private balcony. One-bedroom beachfront suites have a separate living room with a sofa sleeper, a full kitchen and a private patio that has direct beach access. The Delray Sands Resort on Highland Beach Delray Beach hotel is steps from Highland Beach where you will find complimentary beach equipmen, drink service and lots of sand to lounge as well as watersport activities is available from outside vendors. The Delray Sands Resort on Highland Beach is minutes away from attractions such as the Spanish River Park, the S.D. Spady Cultural Heritage Museum and the Morikami Museum and Japanese Gardens. The property has an upscale freshwater swimming pool with a nice sundeck that has drink service, children’s pool area and a fitness center. Dining onsite includes the Latitude Restaurant for all three meals and offsite dining requires a short walk or drive to eateries such as the Sushi Thai Fusion, Scuola Vecchia Pizza E Vino and Novello Restaurant and Bar serves seafood. Nightlife onsite includes live music several evenings a week at Latitudes Restaurant and the Wave Pool Bar or you can take a short walk to Tim Finnegan’s Irish Pub. The Delray Breakers on the Ocean is an ideal boutique Delray Beach hotel that offers all-suite accommodations, a private beachfront and has plenty of onsite amenities for families. Located 2.5-miles south of downtown along South Ocean Boulevard, the Delray Breakers on the Ocean boast a 200-foot private beach within 2-acres of tropical landscape and you are less than 6-miles to Morikami Museum and Japanese Gardens. The Delray Breakers on the Ocean has a modern one and two story architectural design with 22 one as well as two-bedroom apartment style units that feature a bright beach interior. One-bedroom suites have 700 square feet with a separate living room that has a sofa sleeper, a full kitchen and a private balcony/patio that offers a view of the ocean or oceanfront. Two-bedroom accommodations are sized at 900 square feet with a separate living room that contains a sofa sleeper, a full kitchen, 2-bathrooms and a patio that sports ocean views. 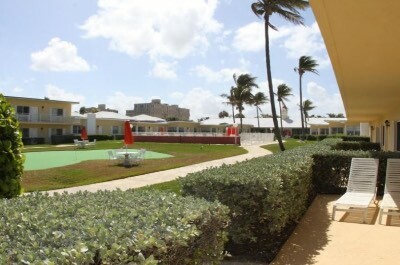 The Delray Breakers on the Ocean Delray Beach hotel has a nice 200-foot stretch of sand overlooking the Atlantic Ocean where you will find complimentary cabanas and plenty of watersport activities are available for rent. The Delray Breakers on the Ocean offers a complimentary shuttle to Atlantic Avenue where you will find shopping as well as the Silverball Pinball Museum and you are 6-miles away from the Wakodahatchee Wetlands. The property has many amenities onsite including a freshwater swimming pool, a putting green, game room with billiard tables and barbeque grills. Dining includes a complimentary breakfast and a home cooked meal in your apartment. Offsite dining that is a short walking distance away includes Eathai for Asian dishes; Granger’s Grille and you are 2-miles from El Camino. Nightlife is quiet in the surrounding area with a short 2-mile drive to the Arts Garage for live music or have a cold libation at Tim Finnegan’s Irish Bar. 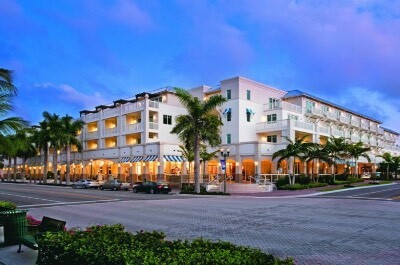 If you are interested in staying at an upscale boutique Delray Beach hotel that is ideal for all types of travelers, offers access to a beach club and country club as well as plenty of unique amenities then the Seagate Hotel and Spa is superb. Located less than 0.5-miles from downtown along East Atlantic Avenue, the Seagate Hotel and Spa is a 2-block walk to the Seagate Beach Club and you are within 3-blocks to the Sandoway House Nature Center. The Seagate Hotel and Spa has a modern British Colonial four floor architectural style with 154 rooms and suites that feature an upscale contemporary decor. Courtyard rooms are 388 square feet with no balcony and standard rooms are sized at 435 square feet with a private balcony. Deluxe rooms are 500 square feet with a choice of bedding, an open floorplan that has a sofa sleeper and a private balcony. Superior rooms are 575 square feet with a choice of bedding options as well as a sofa sleeper is some units and a private balcony with various views. Studios are 588 square feet with a sofa sleeper, small kitchenette (microwave and refrigerator) and a private balcony. One-bedroom Parlor and Bridal suites range in size from 1,000 to 1,100 square feet with a separate living room that has a sofa sleeper, 2-bathrooms, a small kitchenette and two private balconies with city views. The Presidential suite has 1,800 square feet with a separate living room, full kitchen, dining room and a private balcony that sports views of the Atlantic Ocean. The Seagate Hotel and Spa Delray Beach is a short walk to the Seagate Beach Club where you will find complimentary beach equipment, watersport activities for rent, a freshwater swimming pool as well as food and beverage service. The hotel also has a private country club which can be accessed by a complimentary shuttle where you will find a championship golf course and tennis courts. Children will enjoy the organized activities that are featured at the kid’s club. The Seagate Hotel and Spa has two freshwater swimming pools with sundecks, a fitness center, shopping boutiques and a full service spa. Dining onsite includes the Atlantic Grille which is open for all three meals and lunch service at the country club as well as beach club. Nightlife includes a lively bar atmosphere at Atlantic Grille including live music and the beach club offers movies. 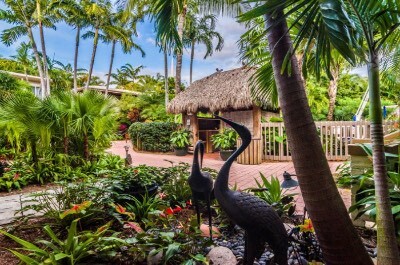 When you want to find a boutique mid-range Delray Beach hotel that offers a quiet tropical garden setting, a free are shuttle and is just steps from the beach then the Crane’s Beach House Boutique Hotel and Luxury Villas is perfect. Located less than 1-mile from downtown along Gleason Street, the Crane’s Beach House Boutique Hotel and Luxury Villas are situated within a manicured tropical garden only 1-block from the Atlantic Ocean and they are 6-blocks away from the Pineapple Grove Arts District. The Crane’s Beach House Boutique Hotel and Luxury Villas have a modern two story architectural design with Art Deco accents that contains 28 rooms, suites and villas that feature a contemporary upscale interior. Studios are sized at 250 square feet with a small kitchenette (microwave and refrigerator) and view of the gardens from a patio or shared balcony. One-bedroom suites have 725 square feet with a separate living room, full kitchen and a view of the gardens from a private patio or shared balcony. Two-bedroom suites have a separate living room with a trundle bed, 2-bathrooms, a full kitchen and a view of the gardens form a shared balcony or private patio. One-bedroom villas are 725 square feet with a separate living that contains a sofa sleeper, a full kitchen, upgraded in-room amenities and a private patio or shared balcony that boasts views of the garden. The Crane’s Beach House Hotel and Luxury Villas allow for easy 5-minute walk to Seagate Beach where you will find lots of sand to relax upon and watersport activities are available from onsite vendors. The property is nearby to numerous attractions like the Cornell Art Museum, S.D. Spady Cultural Heritage Museum and you are 5-miles from the Wakodahatchee Wetlands. The Crane’s Beach House Hotel and Luxury Villas have two saltwater swimming pools with waterfalls which are surrounded by a tropical garden. There is not a restaurant onsite at the hotel and you can find several dining options within a short distance such as J and J Seafood Bar and Grill, the Mellow Mushroom prepares Italian dishes and El Camino serves Mexican cuisine. Nightlife at the hotel is lively with the Tiki Bar where you ca listen to live music on selected nights or you can have a cold libation at Honey as well as the Vintage Tap. If you are interested in a mid-range Delray Beach hotel that offers all-suite accommodations, easy beach access, is nice for families and is close to many attractions then the Residence Inn by Marriott Delray Beach is superb. 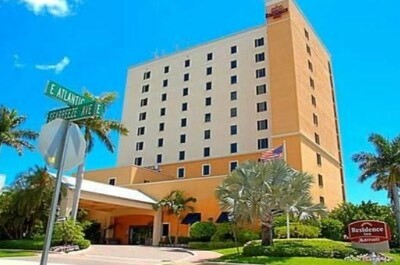 Located along East Atlantic Avenue only 0.5-miles from downtown, the Residence Inn by Marriott Delray Beach is a 1-block walk to the beach and is 3-blocks away from the Sandoway House Nature Center. The Residence Inn by Marriott Delray Beach has a modern eleven floor architectural style with 131 suites that sport a contemporary beach decor. All suites have a private balcony that offers views of the city, Atlantic Ocean or the surrounding area. Studios are sized at 300 square feet with a choice of bedding, an open floorplan that includes a sofa sleeper and a full kitchen. One-bedroom suites have a separate living room, a choice of bedding and a full kitchen. Two-bedroom suites are furnished with a choice of bedding options, a separate living room, dining area and a full kitchen. The Residence Inn by Marriott Delray Beach hotel is short walk to Seagate Beach where you will find beach and watersport equipment vendors as well as lots of room lounge on the sand. The property is within walking distance to several attractions such as the Silverball Pinball Museum, the Pineapple Grove Arts District and the Cason Cottage Museum. The Residence Inn by Marriott Delray Beach has a freshwater swimming pool and a fitness center. Dining includes a complimentary breakfast and you can arrange for grocery service to prepare a home cooked meal in your suite. There are numerous restaurants within a short walk that include Caffe Luna Rosa for Italian specialties; Deck 84 prepares seafood as well as Blue Anchor British Pub. Nightlife nearby includes a cold libation and live music at Boston’s on the Beach or the Hurricane Bar and Grill. The Colony Hotel and Cabana Club is a boutique historic Delray Beach hotel that has a beach club, is close to many attractions and is ideal for all types of travelers including families. 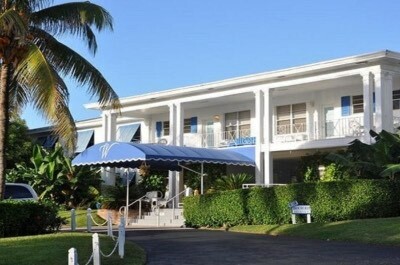 Located in the heart of downtown Delray along East Atlantic Avenue, the Colony Hotel and Cabana Club is situated within a nice garden setting with complimentary shuttle that will take you to a 250-feet private beach and the property is 2-blocks from the Pineapple Grove Arts District. 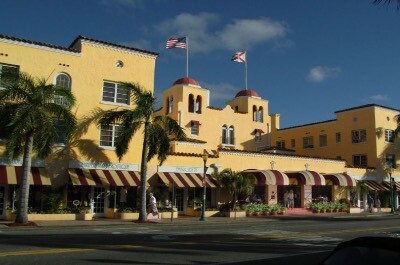 The Colony Hotel and Cabana Club was constructed in 1926 with a Mediterranean two story architectural design that contains 70 rooms and suites that have an Old Florida charm interior. Historic rooms range in size from 225 to 275 square feet with a choice of bedding and a view of the surrounding area from windows. Corner queen and Superior king rooms are between 275 to 375 square feet with a view of the city. Two-bedroom suites are furnished with two queen size beds, 1-bathroom and a view of the city (no separate living room). 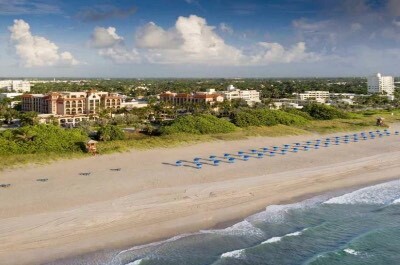 The Colony Hotel and Cabana Club Delray Beach hotel offers 250-feet of private beachfront along the Atlantic Ocean coastline and is accessed by a complimentary shuttle from the hotel. Once at the Cabana Club you will enjoy complimentary beach equipment, a geothermal heated saltwater swimming pool, watersport equipment rentals and there is drink as well as beverage service. The Colony Hotel and Cabana Club is close to several of the areas attractions such as the Cornell Art Museum, Old school Square Center for the Arts and the Sandoway House Nature Center. The property’s amenities include the Club Cabana, yoga classes, shuffle board and there is a fitness center. Dining includes a complimentary breakfast and lunch is served at the Seagrape Grill within the Cabana Club. Offsite eateries are plentiful with choices like Scuola Vecchia Pizza E Vino, Mussel Beach Restaurant has seafood and Cut 432 prepares steaks. Nightlife includes a cold beverage at the Colony Porch Bar where you will find live music on selected nights or you can watch a live performance at Johnny Brown’s as well as the Arts Garage.